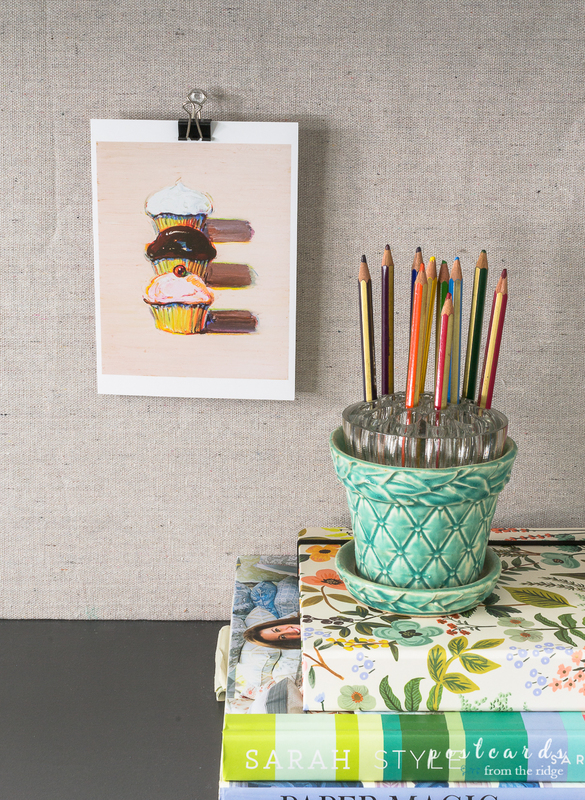 Free printable artwork plus our nearly complete laundry room makeover. This past week has been a rough one at our house with some awful plumbing issues and I'm so glad I had this little oasis of a laundry room to look at. Who would have thought a laundry room could make me smile so much? 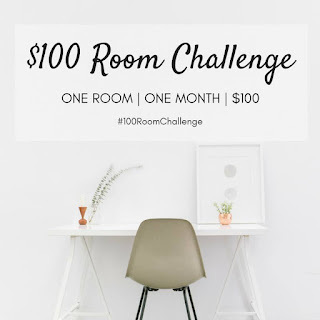 In case you missed the previous posts, I'm participating in a 4-week, $100 room makeover challenge with over 20 other home bloggers organized by Erin at Lemons, Lavender, & Laundry. You can see all the projects at the bottom of the post. 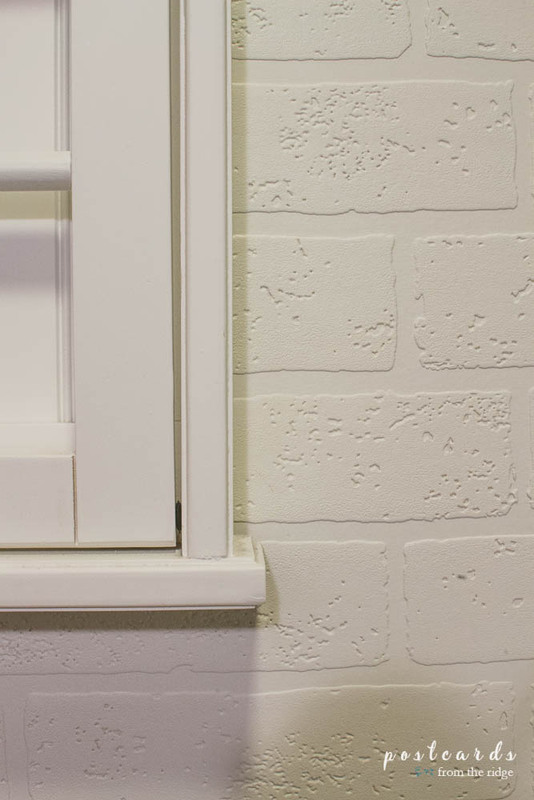 Last week I finished painting the walls and hanging the paintable brick wallpaper. You can see how it looked at that point in this post. And you can see the original plan (that's been tweaked just a tiny bit) HERE. And here's how it looked before I started this room refresh. This week I painted the wallpaper, reinstalled the drying rack, shelf, and ironing board rack, and shopped the house for some no-cost goodies. It's pretty much finished in here except painting the trim around the door, and that shouldn't take more than an hour. WOOHOO! I stole a large woven basket from the family room for corralling our laundry supplies. And would you believe that I had the kitty's bag of food stashed in the metal LAUNDRY box? Yep. It got a good washing and now it has dryer sheets and a bottle of bleach hidden inside. Kitty doesn't seem to mind. I honestly hadn't thought about using it in here before because we don't use powder for our laundry, but instead use the little pods. I bought the bin several years ago because I thought it was cute and just kept the kitty food in it, because isn't that where everyone keeps the cat food? Lol. Now it's right where it belongs. And nobody is confused about why the cat food is in the laundry detergent bin. The brick wallpaper has turned out even better than I had hoped. The texture on it is very realistic and it adds a nice cozy feeling to the space. 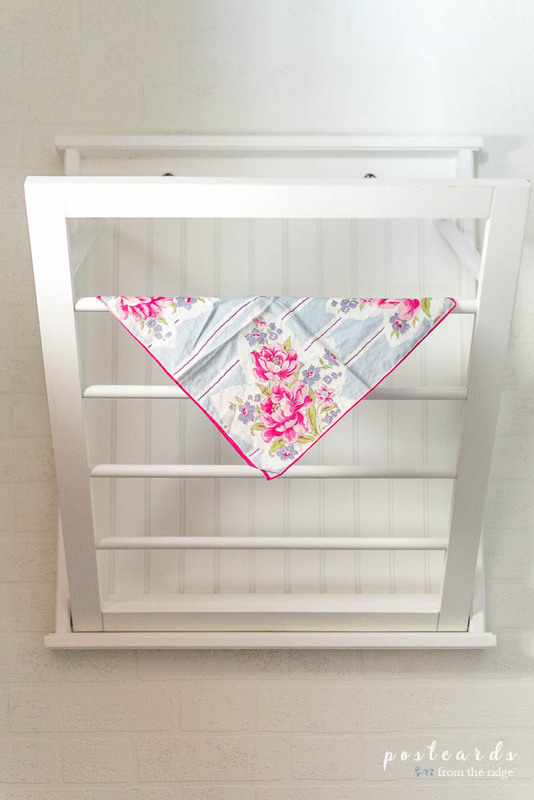 I've collected vintage hankies for a while now and added this cute one for a pop of color on the drying rack. Isn't it fun? 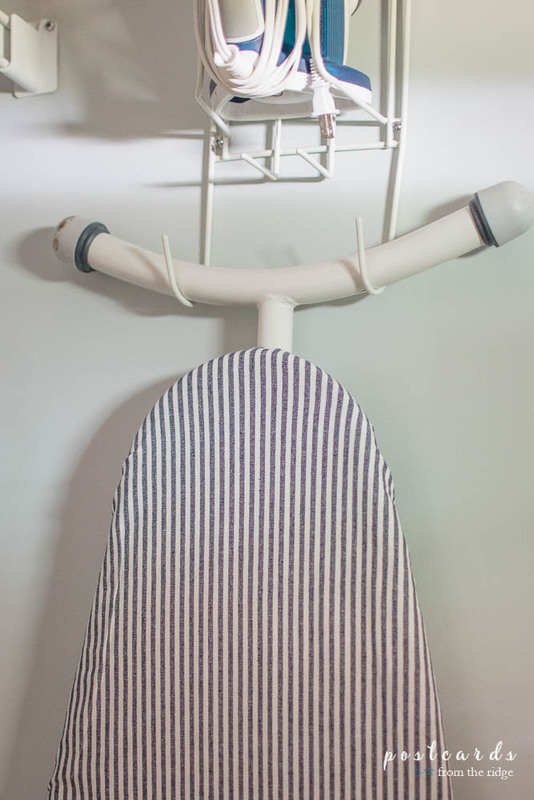 And since I've been able to shop my stash and the house for most of the items I've used and have come in way under my $100 budget, I splurged on a new ironing board cover. The old one was looking a bit tired and this one is nice and fresh. Plus it was 20% off with free shipping when I ordered it. Gotta love a sale. All that's left to do is finish the trim around the door. It has been primed but now needs to be painted. I might also prime and paint the door. I haven't decided for sure about that yet. Stay tuned next week for the final reveal. 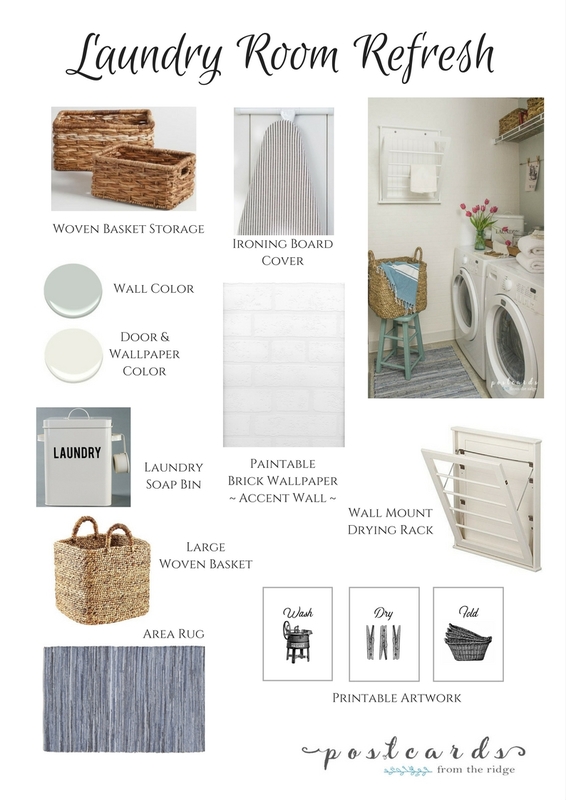 Here's the final design board with sources in case you're interested in bringing a similar look to your laundry room. 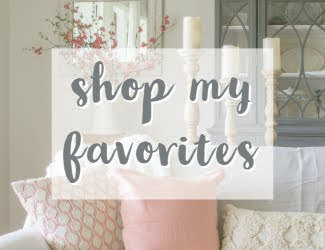 I'll include all the costs next week with the final reveal, but I'm definitely below budget since I shopped my stash and house and used rewards points and gift cards for almost everything used in this project. 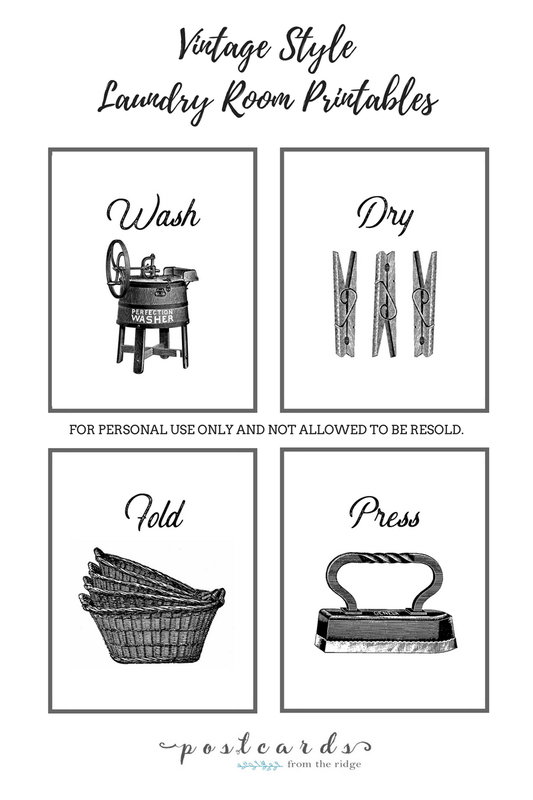 I created some vintage style laundry room printables for the room also. 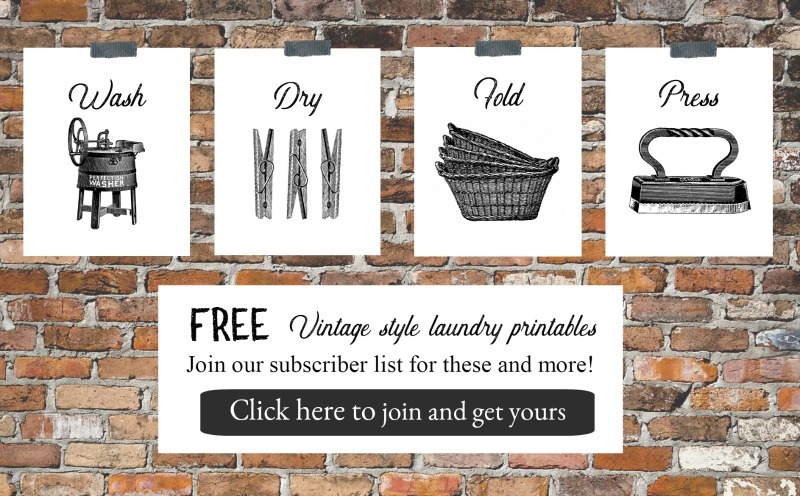 If you'd like these printables for your laundry room, you can get them for free as a member of our subscriber list. Click below to sign up. 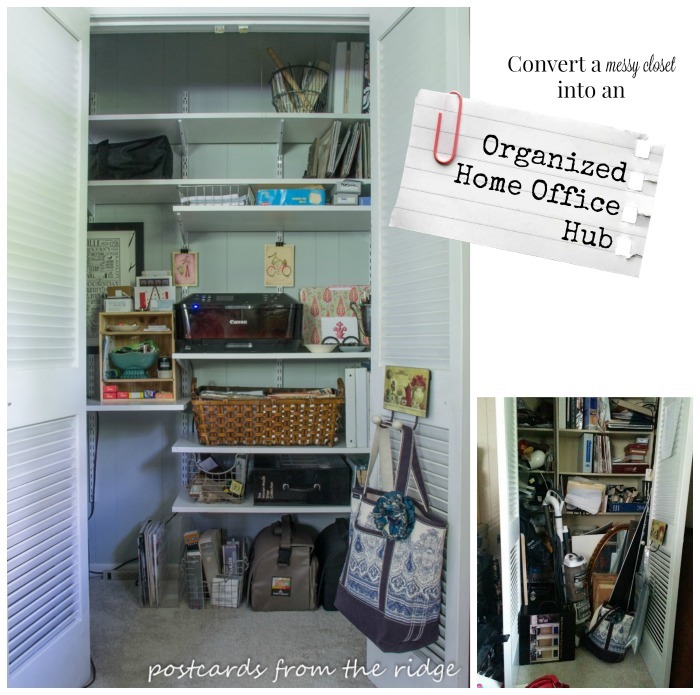 You'll receive a welcome email with access to the printables, and then you'll also get regular updates from the blog including notification of all new member's only printables. You can print them on white paper or on this paper to get more of a vintage look. What do you think so far? Isn't looking fresh and clean? It actually makes doing laundry more enjoyable, if you can imagine that! Here are some of my other low budget projects that you might enjoy. 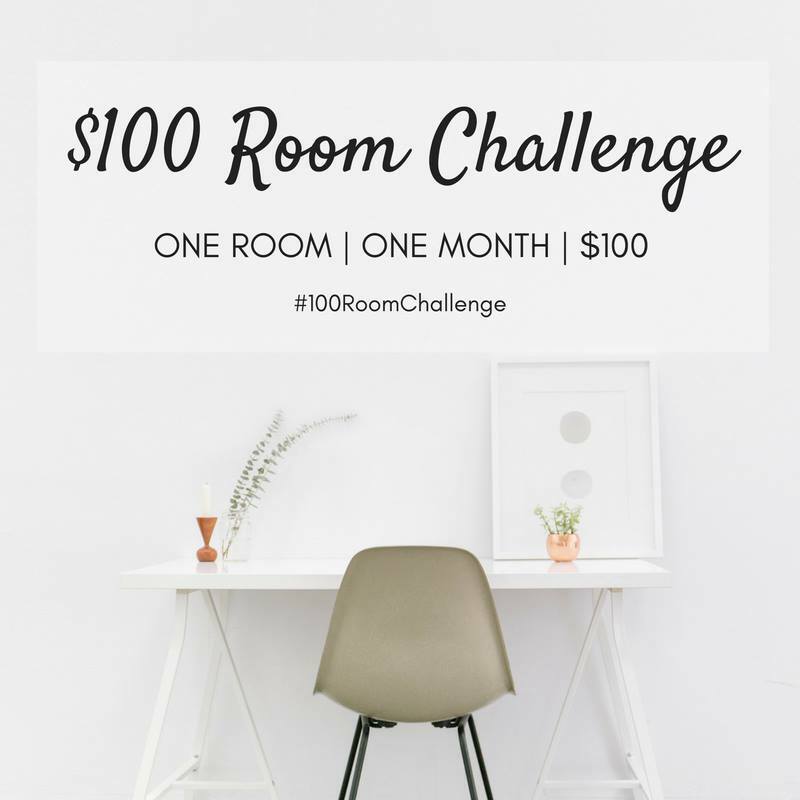 Don't forget to keep scrolling to the bottom of the page to see ALL of the $100 room makeovers. You won't believe how creative my blogging friends are! You are right, that faux brick accent wall works really well in the space! I also need one of those fold down laundry racks in my life. I could see mounting it to the back of our laundry room door since there isn't any wall space. I'm loving the faux brick. And we use the drying rack all the time. I've actually got several things hanging from it as I'm typing this! Your laundry room is so pretty. I'm still in love with that wallpaper and those vintage prints are gorgeous. You would not believe the scorch marks on my ironing board. I just might have to invest in one like yours. My laundry may be next on the chopping block. It sooo needs it. Thanks for inspiring me. Thanks, Patti. The old cover on our ironing board was dingy and boring and this new one really has given it a fresh new look. Thanks, Cindy! So glad you like the printables. I really enjoyed creating them! Angie it all is looking so good. Very fresh and bright. Hey if you have to do laundry you might as well have a pretty space to do it in!!! Have a great week. Thanks, Kris. That's so true! May as well make it pretty! 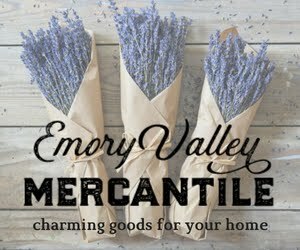 Thank you for those adorable printables!!! Such a cute idea to hang them with clothes pins. Everything in here is looking amazing! 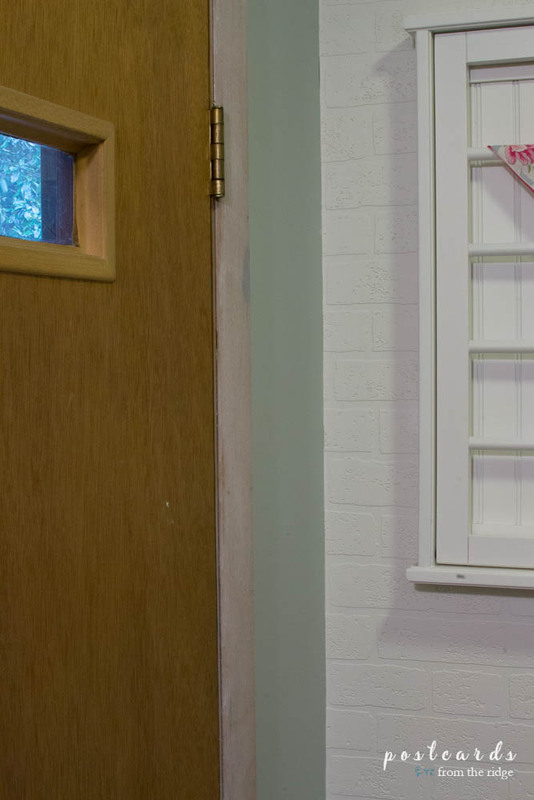 That brick wallpaper is perfect for adding a little texture, and I love that laundry bin (that was holding cat food). Cannot wait for next week!!! Thanks, Erin! I'm really enjoying seeing how far I can stretch $100. It's got my creative juices flowing! It looks so clean and neat and i love that brick wall. Thanks Marlene! I really like the way the brick wall has turned out as well! THAT BRICK WALL. I so need to do this!!! 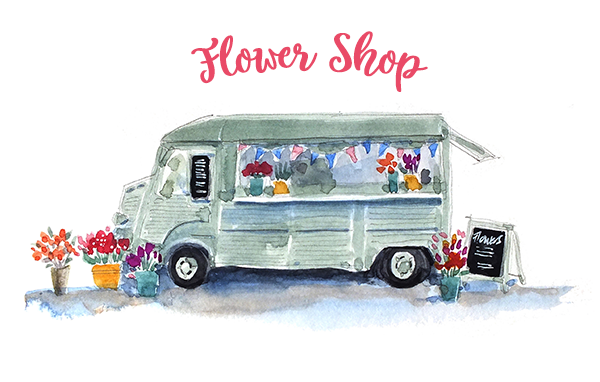 And the printables are just adorable. Great job! Thanks, Deborah. It's pretty easy to do, actually. And I loved creating the printables! The brick wall is so incredibly cool! Thanks, Ashley! I'm loving the way it looks! Loving those prints! Your room is looking so polished already. You're inspiring me to take it up a notch for ours! LOL! Thanks, Eliesa! There wasn't any thing major to do in here, thank goodness. It's all cosmetic and hasn't taken near as much time as I thought it would (thankfully!). It is all looking really good! Love the faux brick wall. Paint the door too!! Thanks, AnnMarie. I think I probably will paint the door too. It will make the space nice and light. You've been busy! Your room is looking great - I can't wait to see the full reveal. Thanks, Carrie! Can't wait to finish the project and move on the the next one. I probably would have hidden our cat's food in that bin, too, because I would never have figured out that it's the perfect little hiding place for laundry items like bleach and dryer sheets. Thanks for the tip. The room is looking great and those laundry printables are downright adorable!! Haha, I don't know why it took me so long to think to put the bleach in there. But I'm glad it finally popped into my head. Nothing like trying to stick to a budget to make me get creative! Glad you like the printables. I enjoyed creating them! This is just gorgeous! 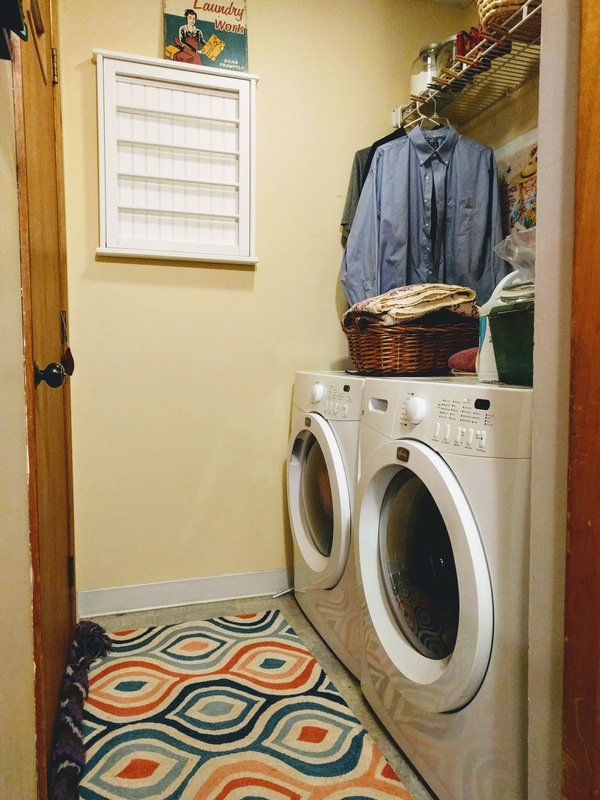 I don't have a laundry room, just a laundry "area" in the garage; and it could certainly use a makeover! Thanks, Jean! 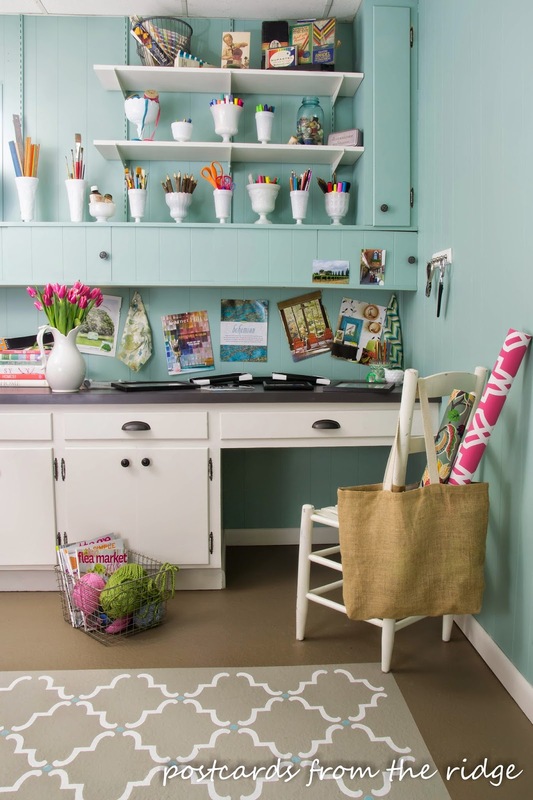 This little space was definitely in need of a refresh! 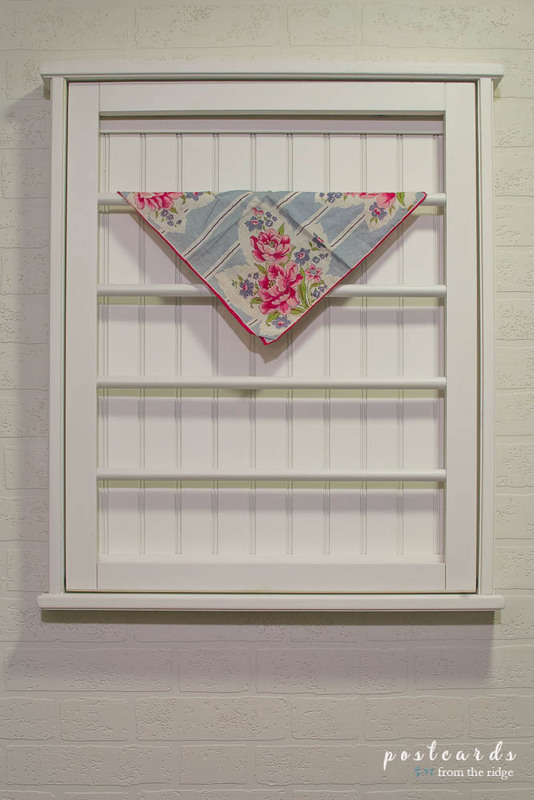 Love the printables for the laundry room,its a fabulous project and so stylish. Thanks, Maria. The printables were fun to create! I'm seriously in love with the brick wallpaper! I keep coming back to it! And the prints are perfect! So jealous that you're almost done! Thanks, Natalie! I have to say it looks even better than I thought it would. And I'm so glad I haven't run into any snags and am almost finished! What a lovely room! I can see those prints framed in my laundry room. They are adorable! Thanks, Colleen! They would look great framed, much better than my low budget way of hanging them! There are so many things to love about this space, I can see why it became your happy place this week! Love the printables! That faux brick wallpaper. Wow! It looks fantastic. You have been busy and it shows. I can relate to the kitty food container....mine is stored in a similar one that says bread!! What a teaser post! The little glimpses look great! And thanks for sharing those printables. They are so pretty! 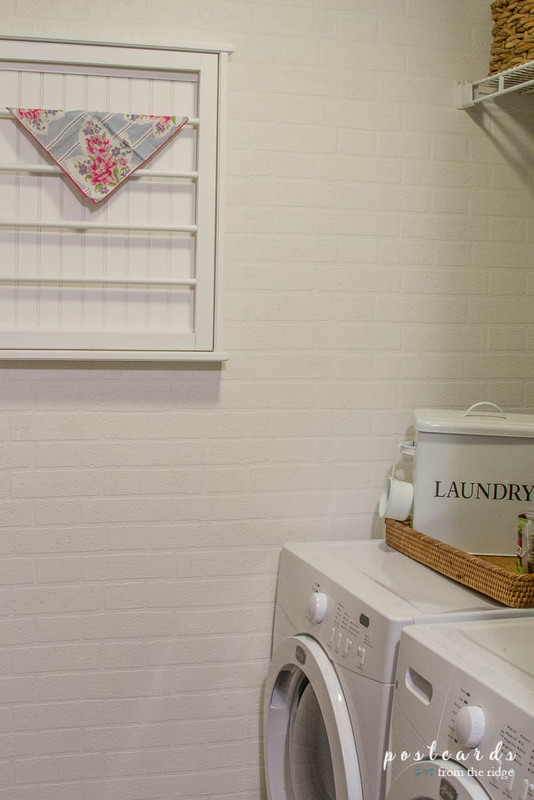 What a great laundry room makeover with great ideas. Thanks for the printables! I'm not sure what I did wrong, but when I printed an 8x10 version of them, they came out blurry. Any suggestions?